ProTools|HD Native is a new generation of Pro Tools|HD system that enables you to compose, record, edit, and mix music and/or sound for picture—with great speed and ease. Consisting of an HD Native Thunderbolt interface, Pro Tools Ultimate software, and Pro Tools HD Series interface, Pro Tools|HD Native harnesses the power of your Mac or PC to deliver pristine sound, incredible performance, and the lowest latency of any host-based DAW. This option does not include Pro Tools Ultimate software. ProTools|HD Native is a new generation of Pro Tools|HD system that enables you to compose, record, edit, and mix music and/or sound for picture—with great speed and ease. Consisting of an HD Native Thunderbolt interface , Pro Tools Ultimate software, and Pro Tools HD Series interface, Pro Tools|HD Native harnesses the power of your Mac or PC to deliver pristine sound, incredible performance, and the lowest latency of any host-based DAW. 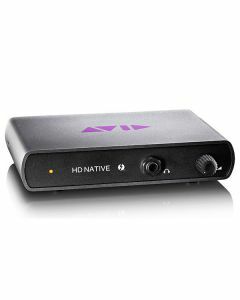 Unlike USB- or FireWire-based DAWs, which are inherently prone to latency, Pro Tools|HD Native employs either a high-speed Thunderbolt interface to connect Pro Tools HD Series interfaces with your laptop or desktop computer. By eliminating distracting monitor latency while recording, increasing your I/O capabilities, and providing 64-bit floating-point processing for more headroom and a higher mix resolution, you get a professional native solution. When recording, the smallest distraction can affect your performance. The most frustrating—dealing with the latency USB and FireWire-based audio interfaces can bring. That’s why Pro Tools | HD Native elevates your recording experience with high-speed Thunderbolt connectivity. This nearly eliminates that distracting delay you hear while recording, leading to better performances. With the Thunderbolt interface, you even get an audiophile-grade headphone output to hear every detail. Moving up from a Pro Tools system? Get more power to create bigger, more complex mixes. Create huge sessions with up to 256 audio tracks and 512 instrument tracks. Capture and monitor up to 64 inputs and outputs at the same time. And handle the most intense virtual instrument and plug-in-heavy mixes easily. Get the highest fidelity and sound transparency when you choose Pro Tools | HD Series audio interfaces, sold separately. Capture audio in stunning clarity at up to 32-bit, 192 kHz resolution. Get more headroom—and less headaches—thanks to 64-bit floating-point processing. Have more room to push things further, without clipping or obsessive gain staging. And get significantly greater dynamic range to elevate your mixes. Free yourself from the confines of the studio and create wherever inspiration takes you. Pair the HD Native Thunderbolt interface with a single rack space HD OMNI audio interface and your laptop and you’ve got a fully mobile, full-powered recording rig. Or compose, edit, and mix with just Pro Tools | Ultimate software on your laptop with your iLok for easy on-the-go creation. Pro Tools | HD Native is completely modular, so you can create the perfect rig for what you do. Connect up to four Avid and/or third-party analog and digital audio interfaces. Work on a Mac or PC. Mix on your full system or on the go with just a laptop. Accelerate mixing by adding a control surface. Integrate into broadcast, post-production, and live sound environments with MADI. And sync your entire studio together as one with included Satellite technology to get the best sound possible. Note: AAX DSP and TDM plug-ins are not compatible with Pro Tools|HD Native systems.